Life experience should be immaterial when it comes to interpreting some images and perceiving some things. You KNOW when someone is trying to clown on you or make a fool out of you. If I give a speech at an event and I see it on televison or in the news paper the next day and from a 2 hour long speech the ONLY image they managed to capture of me is one where my eyes are squinted up and my finger is in my ear where I may have briefly dug in my ear subconsciously....then you know it's a hit job. Like we talk about intuition.....some things you intuitively know. Human beings and especially Black human beings usually have a special gift that allows us to not only look at the action but the INTENT BEHIND the action. We intuitively know that Time could have used a much better looking, more natural, and more pleasant (less shocking) looking picture of Viola. But it isn't. or you'd be a clean slate with no perspective. You only know something is offensive to you based on life experience. For example, when flying to Dubai, I wouldn't offer my left hand to any passenger unless I'd want to offend them. Or, you didn't know you were a human male as an infant or even a toddler . You began to have experiences, such as seeing similar beings that forced you to realize you weren't unique, you probably identified with those who looked like you, young or older and you began to imitate them. Then your experiences shaped your life as a boy and you grew into a man. Life experiences and instructions are how we develop our perspective, a point of view. You can be intuitive as in building on what you already know; but intuition is knowing without the benefit of experience, facts or (gasp) proof on a subject. I think conceptually. So even thingsi haven't experienced I can discuss. I may get it wrong but I can see other ways. It's an interesting dynamic Mel and Cynique see your point. Or at least can accept that it is valid for you even though they don't agree. It's as if your viewpoint stops you from considering that another viewpoint is valid. This is rhe difference between a masculine and feminine approach in my mind. I agree with Mel. And i disagree that we always know when somebody is trying to "clown" us, or do all African Americans instinctively know the back story about situations. Sometimes things are very nuanced and subtle and not everybody perceives the intent of words or images Or if someone is a paranoid, super-sensitive person, they see things that aren't there or misinterpret what they do see because their personality type is one that is not good at being objective. Because we are individuals who come from different circumstances and have different traits and tendencies, our reactions will vary but even if we just observe, what we see can't help but make an impression on us, and be processed by both our conscious and subconscious minds. The ultimate result is a person who has coped well or bad with what he has encountered in his life's journey. Wow Del you say I have a blind spot, but clearly, you are not understanding what I've written; which was clear. I've understood that you do not think Trump is racist. What I'm asking for the 3rd time is, do you think Trump, at least sometimes, behaves in a racist manner? While you do not think he is a racist, I'm trying to discern if you think any of his behavior could be confused with someone who is actually a racist. I find it interesting that you could so easily call me a sexist, but find it impossible to call Trump a racist. I'm not even sure if it is worth collecting the data on the photo. Perhaps a more fundamental question like; does the white racism adversely impact Black people today? Troy before i answer. I am going to go back and see if you asked me if I thought his behaviour coukd be seen as racist. Slaves were bought and sold for work. I know that yiu don'tean it this way. However the products we are sold goes beyond yhe intrinsic value and its the perceived that we purchase. An ipod is blank space. Yet ot cost more than a flash drive. What you are asking is Not clear. Do I think he acts in a racist manner. Is not at all the same question as do other people confusedly seeing Trump as racist. I don't need racism to define his behaviour. Troy yiu asked the question four times. The last two are the question you asked me in your head three times. You responded that you thought he did. Trump is a narcissist a misanthrope and greedy. He uses racism as a tool. What behaviour do you have in mind that Trump displays racism. Del you are over analyzing what is a very simple question. Turn off your spidey sense and stop trying to divine what you think I mean. 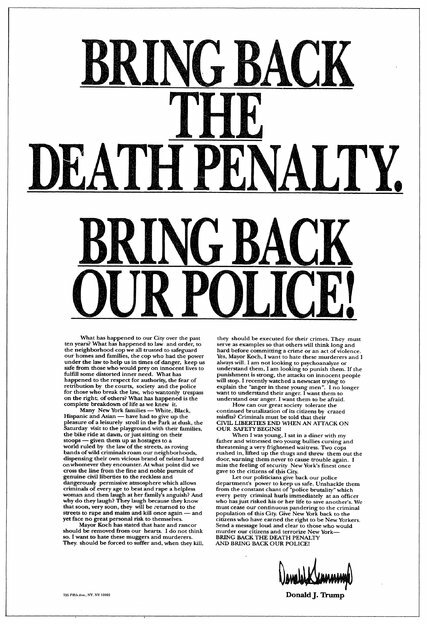 I got my first sense of Trump's racism when he took a full page advertisement the NY Times calling for the death of the Central Park Five. These were children from my neighborhood, who I identifed with and saw myself is potentially being in the shoes. Trump exercised no compassion all. He did not wait for a trail. The boys were presumed guilty and he used his financial resources to call for their execution for a crime that did not involve a murder. This was a time when several Black men were being murdered several times a day in the same city. I'd grant you it is possible that Donald is not racist (as you believe), did not behave in a racist manner, and was only seeking justice for a young white woman. Again I'll willing to accept it is possible, but I think it is not very likely. He uses racism as a tool. Yes, Trump absolutely uses racism as a tool and I assume must, therefore, behave in a racist manner in order to do so. Does it really matter to the victim if the victimizer is an actual racist or simply using racism as a tool? If there is a difference, I would say the person using racism as a tool is worse, because they can not claim ignorance or stupidity as an excuse for behaving in a racist manner. Mel, Del (anyone) even given the Central Park Five example I gave, do you really believe that race did not play a role in Trump's reaction? I can give more examples but if this one does not sway you in any way I'm sure there is nothing I can say will get you to consider the possibility that Trump is racist. Perhaps that is why so many Black people voted for Trump, they do not see him as a racist. Yes, here we are in agreement. Those Fools are easy to spot. Most of the GOP use racism tools to achieve their goals. 45*s their leader and his racist bag tricks included but not limited to the birther movement (black president is illegitimate) , central park 5 (black thugs attack white pure woman), housing discrimination (blacks bring down the value of the neighborhood) - and it continued to grow until he founded his movement of hate. We often forget not everything that hits the airwaves is for our consumption. We have a meme -dog whistle politics so we have to ask ourselves. Who is the intended target for the message. 45* has been trying to become president for a while - so this time he ran a campaign that appealed to the most deplorable beings in this country. The blacks who voted for him are the same blacks who wallow in self-hate. Having said all that, @Troy, No I won't say 45* has to act in a racist manner to execute his racist campaign of hate... Too many people play roles to achieve their goals. It would be naive of me to put anyone in a box. That's dangerous. "Every mark and every play of any con game is different. You have to memorize the elements of con." Any hustler knows you got to play people how they present - to decide they're one thing or another is to get played. IMO, racism comes in degrees and, in its benign form, is wide spread. I tend to believe all white people are racist but they are not rabid ones. Pleasant, civil, white people who think all blacks look alike are racists. Ones who think all blacks have rhythm or are good athletes are racist.. Ones who want to touch your hair are racist. Ones who tread lightly around blacks because they don't want to appear racist, are racist. These racist types mean no harm. They know racism is wrong and choose not to practice it if nothing is to be gained by doing so. And this could apply to mixed couples. A white woman who has a bi-racial daughter is racist when she looks upon her child's nappy hair as an anomaly she has to try and tame. I think Donald Trump was born a racist because he was a child of privilege and wealth, circumstances that go hand and hand with racism and he is well qualified to use racism as a tool. i even think, Bernie Sanders is racist. He is paternalistic and patronizing and thought he knew what was best for blacks. Hillary Clinton, too, but she is shrewd enough to keep her racism in check. Black people can't be racists but they can be prejudiced and when it comes to white folks, they harbor many prejudices about them..
Everybody is bigoted to some degree. But, as we all know, not everybody can empower their biases. Sure we all lie somewhere on the bigot and prejudice spectrums. These characteristics in some small degree are necessary for survival. Too much however and your world is a less happy place. Trioneer you are now telling me how to think. I'lltrad the rest of your post later. The reason i coukd see Trump as President is because he is PT Barnum. He know what people want to hear. He has no ideology other than grab as much ___ as possible before you go. I'll be nack on a day on this topic. Troy Donald Trump is about putting his name on the papers. He doesn't care about the kids or the victim. He Is an OPPORTUNIST. He has no ideology othwe than winning points against people who he feels aren't on his team. He thinks people are great until they disagree with him. I believe in self determination. So when women say what other women can and can not do. They are enemies of feminism and are more dangerous than sexist men. Yiu and Pioneer have devolved the discussion into not just being right. But we have to see it yiur way. You are even telling me to stop thinking so much. Hey Troy I am a thinker. And believe people should be free to choose. Even if they are misinformed. So either I am lazy or believe that my path is mine to walk as i see fit. And i feel the same way except towards ignorance masquerading as wisdom. Mel I would say selfish People voted for Trump. Ronald Reagan made it cool to be unfeeling. Cynique if they mean no harm they are prejudiced or prejudging. Faces at the Bottom of the Well by Derek Bell. Is an interesting take on racism in America. Its different in different parts of the world. @Delano Do you think racism is exclusively about doing harm? Do you think prejudiceness is harmless?? Prejudicing limits the projectors experience. And diminishes the projection. The need not be linked. Let's say I have a preference for certain types of individuals. That is fine to express in my personal life. However if I make economic decisions and that excludes people for arbitrary or non merit reasons, then i am harming others. I didn't say racism and prejudiceness were the same. Had i thought that i wouldn't have applied one term to whites, and the other one to blacks. But I certainly don't think prejudiceness is harmless. I didn't say they were what I was trying to say was the prejudgement is first. And the potential harm is potentially second. So You could have Prejudice that harms no one. But Racism has the object of the racism. If you have a coworker that hates Black people. But this doesn't manifest in their behaviour. They are prejudicied. For me Racism requires a dminishment of the object. The subject need not be conscious of their prejudicied but it has to influence their behavior. Much like the negative comments about Viola Davis's appearance. No Troy I am darker. Insert the appropriate emoticon. Either that or it was strategic in the sense that they figured having a more overt racist in the Whitehouse would mobilize Black America and force us to unite and organize in a way that we ordinarily wouldn't have. When I lived out on the West Coast, I met Black people who actually voted for Ronald Reagan for President. They lived up under him as Governor of Califnornia where he cut welfare and other social programs that disproportionately affected Black and poor people. It was weird but they said it was the best thing that could have happened because it forced more Black people to become independant, stop relying on government, and build their own economic base. Whether that type of "shock therapy" actually works, I'm not sure. But I do believe that although she's defininitely the more qualified of the two, under Clinton.....like under Obama....Black people would have been lulled into a sense of satisfaction and optimism that would most likely have been detrimental to to our development and progress. Troy I can't read the print. However there is a bold statement at the end. Civil Liberties end when our safety is threatened. That line really Trumps the Racist argument. I will use an example that your team will understand. I am a scientist and your team is superstitious. You ask do I think Lightning happens because the Gods are angry. I try to gently explain that while you may believe that to be the case. I am content with the the explanation that Lightning and Thunder are two seperate occurrences. @Delano, what confounds me is that you have summarily rejected my opinion and Pioneer's (which are not identical despite you lumping all those who disagree with you in the same bucket) and elevated yours above all other as if it is correct. You stated that Trump is not a racist as if it was fact. You can't possibly know that any more than I--unless of course, you are suggesting some extrasensory perception is in play here (which you have not). I give you evidence that of Trump's behavior that might suggest he is racist and rather than reflecting on it giving it a microsecond of consideration you stubbornly sought ways to reject it. It reminds me of your attempts to demonstrate to Pioneer your ability to tell the future, while he rejects your evidence as quickly as you serve it up. I think Pioneer is more justified than you are in this particular instance. But again, the fact of the matter is that neither of us can know Trump's true motivations. @Pioneer1 , I could see the guys point it is the conservative party line. I actually wrote, in a perverse way, I would like to see what a Trump presidency would look like. I regret the sentiment. Troy I am not rejecting your opinion. I just don't share it. I don't agree with Mel or Cynique's opinion. No i didn't say it was a fact. We are discussing opinions. You are either intentionally or inadvertently being both thick and or accusatory. The reason and rationale is leaving your argument. The print on the Trump manifesto is small. I actually loaded it on my laptop. I will read ot later but the argument is devolving. And i am not wholly responsible for that occurence. Do you want me to agree or disagree with you. Just ask one simple question. Simple as in not compound. For example Do I think Trump is racist and do other people think he is possibly racist. Btw the last half of that question is difficult to answer even with my world renowned psychic ability. Troy and Pioneer my apologies. I am attacking the person not the idea. My apologies. @Troy I will read the ad and respond later. Troy I read the article. He sounds like a s law and order politician. He sounds like a small hateful individual. It's a racist statement. As i have defined racism. I've noticed that one of the reasons so many Black people don't see racism in society is because they aren't looking for it. Since WE don't practice it on a regular basis, we don't think anyone else is. If we own or operate a television show, website, or magazine our purpose is to entertain, diseminate information, or advertise......not necessarily to promote prejudice or Black Supremacy. Since racism and deception isn't on OUR MINDS and not apart of OUR AGENDA it's often unthinkable that OTHER people could or would do it. And this one of the reasons Black people are constantly caught up and caught off guard. Until proven otherwise, EVERY TIME Whites and Blacks interact with eachother we should be aware of any racism....subtle, blatant or otherwise. When you stay in a "preparedness" mindset, then these things don't get pass you. Pioneer I think you have a point. I've been the victim a racist on more than one occasion recently. Another white guy came by and defused the situation, by quite cleverly giving me an out. You see I felt this white woman had mistreated me, she was crying bloody murder threatening to the call the cops and her husband, and I was like, bring them. The situation was so freaking stupid (I'm ashamed to describe it) and escalated unnecessarily, but she was what was I perceived to be a piece of poor white trash and I simply could not just walk away (poor judgment on my part). You see I was right, but I could have been "dead right" or "locked up right," in any event, it was not worth it. The problem with assuming all white people are racist Pioneer is that we cut ourselves from potentially great relationships. The guy who defused the situation could not have possibly been a racist otherwise he would have taken her side. One of the reasons I left corporate America was that I simply got tired of trying to figure out who was racist. I was tired of feeling like an outsider, someone that would never really fit in. Some of my peers fit in, married white women, lived in white communities, and did culturally white things. I'll continue to play folks on how they present- and if they present differently each time we meet I'll play the side facing up. Troy I worked with a guy who both I and my Asian co-worker thought was racist. But he liked me. There was a racist guy at the bar, that used to juy me drinks and talk with me. I enjoy expanding minds. This is what i meant by "benign" racism. i have a few white acquaintances who i consider racists because they voted for Trump and are pro-police, but we have similar interests in other areas that bind us. Incidentally, i think any white person who voted for Trump is a racist who hides behind their rationale for having done so. That's because i'm prejudiced. There is a difference between implicit or benign racism and explicit "hood wearing" racism. Often the racist does not know he is racist. Similarly, Black folks can experience racism without being aware of it, but that does not mean it is not present--it just means we did not perceive it for whatever reason. I just learned about a book, which I just purchased, that talks about this how racist we are based upon big data collected from google searches. I've met a LOT of White people who've helped me and I'm working with some right now. But that doesn't justify me being naïve and letting my guard down. I think most of our people really subconsciously LOVE White people and don't want to accept that they don't love them back, which is why they repeatedly give them the benefit of the doubt and let their guard down and wait UNTIL they are fucked before putting up a defense. The question you should ask yourself is do most White people give US the same benefit of a doubt that so many of us give them? Look at the clenched purses and locked car doors. We have more of a reason to be mistrustful and apprehensive of Whites than they do of us, yet many of them STILL don't trust you even without knowing you. I can't count how many times I've been on an elevator and if I'm standing infront I can feel the eyes staring at me from the Whites on that elevator. It's the same when I go to the men's room. I can wash my hands and an Asian man will wash his and go. A Mexican will wash his and go. Another Black man will wash his and go. A White man will wash his hands and most of the time take a quick glance over at me or another Black man. All of us are born and raised in the same nation at the same time but it's almost as if they're STILL not "used to" Black people....especially Black males. My point is they notice US even when we don't seem to notice THEM. Too often Black people toddle along in society smiling...trusting everyone...and thinking everything is everything, all the while not aware that other people watching and studying them and are actually suspicious and mistrustful of them. We were the same way in Africa, and look where it got us. I'm just saying given that climate or atmosphere of racial awareness, it would be wise to stay on guard. i have a few white acquaintances who i consider racists because they voted for Trump and are pro-police, but we have similar interests in other areas that bind us. Incidentally, i think any white person who voted for Trump is a racist who hides behind their rationale for having done so. The weird thing is that I've always been political....even on the various jobs that I've held. And despite my being political and even racial, many White racist feel that they can "confide" certain feelings in me that apparently they don't say to other Black co-workers....despite the fact that many of those Black workers could care less. I've had so many long discussions with right wingers and conservatives and a few open racist and a few of them I'd consider......not friends....but "dialog buddies" for lack of a more accurate term because although our views are different we enjoy debating and discussing with eachother and many of us tend to notice the same things about society. So often the political Black people and political White people could get along better with EACHOTHER even if our politics were totally opposite....than we got along with other members of our own race who just wanted to talk about sports or something silly or foolish. I think being political minded is a personality trait. You have to be "wired" that way and if you are...you jive with others who are wired similarly even if they don't agree with your particular politics or even share the same race. Hey man that is something I had not considered. I believe this to be true to a certain extent. It explains why we spend so much time trying to emulate them and strive for their validation. "The white man's ice is colder." This mentality holds us back, because white folks don't return the love unless you are a Black celebrity. This too is a result of white racism, and Black people who love white folks more than they do Black folks would never EVER see it that way. Perhaps you are thoroughly wrong. Its the money power and perceived freedom. I never thought of this photo of Viola as racist until I saw this survey asking if it was. But I definitely see the concern that bigots who laughed at such racist images will compare it to this one, and how Blacks stigmatized by these images could see them suggested here on this cover. My first impression was that it was just an awful picture of Viola. There's something trippy about it. They are taking this whole poster child of Black poverty thing way too far with her. She may be succumbing to it because so much has happened for her so fast and it's hard to manage it all the way premiere public artists can when the pace is slower. It just looked to me like the picture was trying to make her look way too overjoyed about her success and Oscar win, as if she was nearly high on ecstasy that Hollywood saved her from starving in the backwood. So, you have the more mature and confident Viola on the ESSENCE covers Troy uncovered and posted for comparison. That is because Black people just respect her work and her brilliance. We appreciate her for our awe of her talent and what she can do. We do not care where she came from or what she overcame to get where she is. We do care, but it's not some do-gooder feel good story for us. We can see and recognize who she is naturally as just a person and human being we'd love to go to dinner or shopping with. But, the mainstream media wants to turn her into this clown or "Different Strokes"-like story. She is that little colored child who can make others feel comfortable that America does work for everyone, if only they work hard enough and have genius. I think that is more where they were going with this, and failed. They put all these bright colors around her and on her. 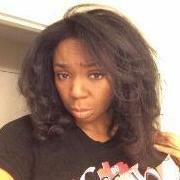 They are unbecoming of her as not just a dark brown woman, but as a mature and sophisticated (and wealthy) woman. She looks silly and childish, as if she's just soooooo happy to be invited to the party. The truth is Viola has been at the party for nearly two decades now. So, she's past this. Their pictures of John Legend and Colson Whitehead are more of what I would have expected for Viola Davis, but such a photo would not have made a cover to fly off the grocery store shelf or go viral. At the most, they should have positioned Viola as they depicted Leslie Jones- full of life, boisterous, happy and styled for her age. But at the end of the day Mrs. Davis is doing her thing, living her dream and finally wielding the influence she deserves to wield. I am sure she knew TIME wanted to slap some ugly lipstick and an ugly dress on her for that same old vision of what a Black woman like her should be and feel. She let them win that battle so she can keep on winning the war. I think we are going to see some cool and brilliant stuff from her for a really long time, even in the director's and producer's seats with more stories we can be proud of, so the joke's on TIME. Kalisha, thanks so much for sharing your thoughts. Again thanks for reminding me that Viola is indeed winning the war this is what matters most in the long term. While we can point out this "micro-racism," we can, at the same time, continue to support her work, so that the cool and brilliant stuff, we so desperately need, comes to fruition. I just want to know if that picture which appeared on its magazine was taken by a TIME camera man specifically for the 100 most influential entertainers' cover. If this is true, then the point Kalisha is trying to make has validity. But i still think that that picture is not a recent one. I really believe that is an old picture taken at an event and because Time perceived it as displaying a woman who was surprised and pleased, thought it was befitting of someone who had just won something, and they used it. I also think that just as TIME read something into the picture, that many black people are also reading something into it, creating a whole scenario, convinced that TIME had her pose for this picture and tampered with it to make a caricature of black women. I certainly don't think Viola would be a willing participant in something that could be considered degrading. She's a big enough star to reject this. BTW, Where did Jamie Foxx get his inspiration from the over-the-top character, Wanda? Is this art imitating life? If you guys want to think that a dark-skinned black woman smiling broadly, wearing red lipstick is offensive and something to be ashamed of, then so be it. I stand by my point that though it is not a posed picture of Viola looking her best thanks to being groomed and made over, the Time picture picture is one of her looking the way she did and millions of black women do look. It is, what it is. i would sure like to get Viola's feed back.